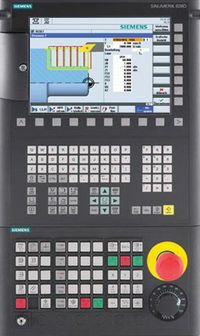 Sinumerik Alarm 6430 Workpiece counter: overflow in table of monitored cutting edges. No more cutting edges can be entered in the piece counter table. As many cutting edges can be noted for the workpiece counter as are possible in total in the NCK. This means that if for each tool each cutting edge in each TO unit is used precisely once for a workpiece then the limit is reached. If several workpieces are made on several toolholders/spindles simultaneously, it is possible to note 18100 MM_NUM_CUTTING_EDGES_IN_TOA cutting edges for the workpiece counter for all of the workpieces. If this alarm occurs, it means that cutting edges used subsequently are no longer quantity monitored until the table has been emptied again, e.g. by means of the NC language command SETPIECE or by the relevant job from MMC, PLC (PI service). • Was decrementing of the piece counter forgotten? Then program SETPIECE in the part program, or add the correct command in the PLC program. • If the part program/PLC program is correct, then more memory should be set for tool cutting edges via the machine data $MN_MM_NUM_CUTTING_EDGES_IN_TOA (can only be performed with the necessary access rights! ).